Hand #164: Silverman folded the button. Cliff Jospehy raised to 55,000 from the small blind. Evan Silverstein reraised all in for 591,000 from the big blind. Josephy called. Josephy was still ahead on the flop, but the turn made Silverstein trips. The river was a blank and Silverstein doubled up. Attention players and fans, if you frequent the PokerNews Live Reporting blog, then you've probably noticed a new tab here at the 2013 World Series of Poker. 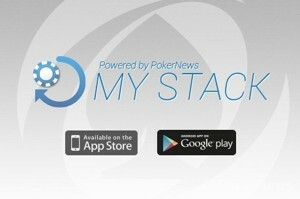 If you haven't yet, or you're new to our live coverage, then let us be the first to introduce you to the Player Updates tab powered by the PokerNews My Stack app. You can download the app for iPhone or Android now to get started. Then, create a new PokerNews account or update your current one to start updating your status immediately. Your followers can see all the live action that you're involved in. Be forewarned, however, any abuse of the app will result in account suspension or termination. We look forward to your updates at the 2013 WSOP in Las Vegas! Players are now on a 60-minute dinner break. Chip counts will be posted shortly. Hand #158: Cliff Josephy called from the small blind. Evan Silverstein checked his option and the players went to the flop. Silverstein bet 28,000 and Josephy folded. Hand #160: Silverstein raised to 40,000 from the button. Josephy called from the big blind. The flop came and both players checked. The turn was the and both players checked again. The river was the and both players checked for a third time. Cliff showed for a pair of s and he won the pot. Hand #161: Silverstein got a walk in the big blind. Hand #162: Josephy raised to 45,000 from the button. 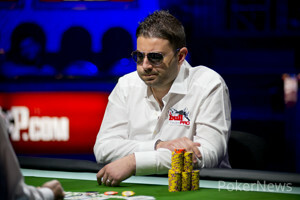 Silverstein folded but Silverman called from the big blind. The flop came and both players checked. The turn was the and this time Silverman 40,000. Josephy called. The river was the and both players checked. Silverman showed while Josephy showed and both players chopped the pot. Hand #163: Silverstein raised from the button and took down the pot. Hand #153: Steven Silverman took a walk in the big blind. Hand #154: Steven Silverman called from the small blind. Cliff raised from the big blind and Silverman folded. Hand #155: Cliff raised to 45,000 from the small blind and took down the pot. Hand #156: Cliff raised to 45,000 on the button. Silverman called from the big blind. On the flop both players checked. They both checked again on the turn. On the river, Silverman checked and Josephy bet 40,000. Silverman called and showed and won the pot with ace high. Hand #157: Silverman called from the small blind. He was raised by Josephy in the big blind who made it 60,000. Silverman called. On the flop, Silverman checked. Josephy bet 55,000. Silverman called. On the turn both players checked. The river was the and Silverman checked again. Josephy made a bet of 150,000 and Silverman folded, shipping the pot to Josephy. The board ran out and Josephy's jacks held up to eliminate West from the tournament. Hand #149: Tim West moved all in from under the gun for 329,000 and he won the pot. Hand #150: Steven Silverman raised to 40,000 from the small blind. West folded from the big blind and Silverman won the pot. Hand #151: Silverman raised to 40,000 from the button. Everyone folded and Silverman shipped his second pot in a row. Hand #148: Steven Silverman raised to 40,000 from under the gun. He was called by Cliff Josephy from the button. Longobardi then moved all in from the small blind for 216,000. Silverman folded. Josephy tanked then called showing . Longobardi was ahead with . The board of brought Josephy a full house and eliminated Longobardi from the tournament. Hand #145: Evan Silverstein raised to 40,000 on the button and took down the pot. Hand #146: Longobardi moved all in from the under the gun for 197,000 and everyone folded. Hand #147: Steven Silverman raised to 40,000 from the cutoff and he won the pot without a contest. Hand #144: Action folded to David Baker who moved all in from the small blind for 452,000. He was snap called by Steven Silverman in the big blind. The board came giving Baker a pair, but it wasn't enough to out run Silverman's aces. Hand #140: Everyone folded and Cliff Josephy took a walk in the big blind. Hand #141: Cliff Josephy raised to 45,000 from the small blind and took down the pot. Hand #142: Steven Silverman raised to 40,000 from the hijack seat. Cliff Josephy reraised to 80,000 from the button. Action folded back to Silverman who moved all in for 379,000. Josephy folded and Silverman won the pot. Hand #143: Action folded to Evan Silverstein who moved all in from the small blind. David Baker folded and Silverstein won the pot. Players 21 years of age and older who sign up for a WSOP.com account will automatically be entered into the "36-Seat Giveaway" where a randomly-selected winner will win a seat into the next day's first WSOP gold bracelet event. One of the events eligible in this promotion is the $111,111 One Drop High Roller No-Limit Hold'em tournament that is expected to feature a $10,000,000 prize pool and allow you to play poker with the biggest names in the game. In total, $182,333 in WSOP seats, including a seat to the WSOP Main Event, are being given away during this one-of-a-kind WSOP.com promotion. 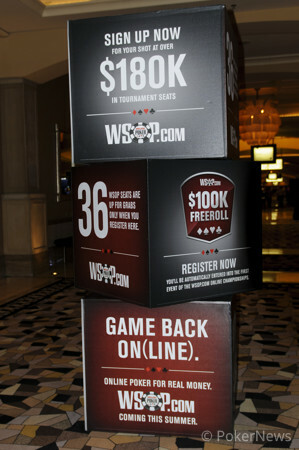 In addition to the 36-Seat Giveaway, a "Hot Seat" promotion will allow any player who signs up for a WSOP.com online account and wears their WSOP.com patch on their chest at the table while playing an event to be randomly selected to receive 500 bonus dollars deposited directly into their WSOP.com online account once the site has received all regulatory approvals and launches. Hand #135: Cliff Josephy raised to 45,000 from the small blind. Longobardi raised all in for 159,000 from the big blind. Josephy folded and Longobardi was pushed the pot. Hand #136: Longobardi moved all in from the small for 219,000. The big blind folded and Longobardi scooped the pot. 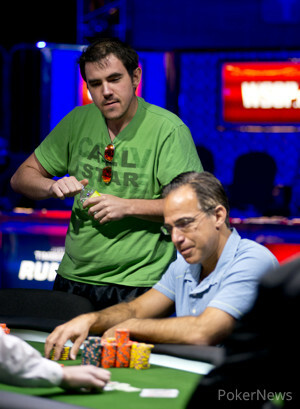 Hand #137: Steven Silverman moved all in from under the gun for 289,000. Everyone folded and Silverman won the pot. 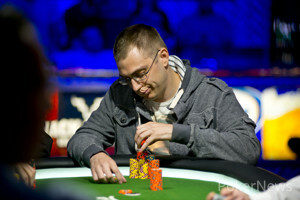 Hand #138: From under the gun Tim West moved all in for 374,000. Everyone folded and West picked up the pot. Hand #139: Baker raised to 42,000 from the button. Silverman moved all in from the small blind. The big blind folded as did Baker and Silverman won the pot.